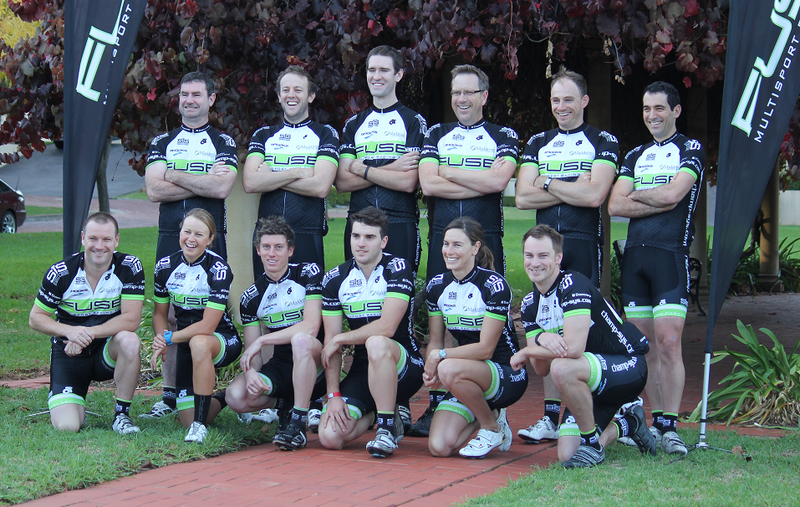 Adelaide, December 2013: After a full 2012/2013 season which included competing in events in New Zealand, Queensland, Victoria, and Tasmania, South Australian based triathlon team Fuse Multisport will embark on a challenging national racing program in 2013/2014 which will include events in Devonport, Geelong, Melbourne, Mooloolaba and the Gold Coast. With the focus events of the 2013/2014 calendar occurring towards the end of the 2014 season, Fuse Multisport athletes Ben Tripodi and Sam Tebeck are undertaking an extended strength phase of a training regime culminating with the Mooloolaba Multisport Festival, with both athletes targeting the draft legal Continental Cup event there. Although well into a strength phase, Tebeck and Tripodi have each shown early indications that preparation for the late season focus events is on track with solid results at recent South Australian events, including a 3rd place to Tebeck at the State Sprint Distance Championships, and a win to Tripodi at the 2nd round of the South Australian Copyworld Triathlon Series, both in the open category. Frustrated by a nagging leg injury throughout 2012/2013, Tebeck is relishing the opportunity to improve his run performance over the December-February period. “Not being able to run in the June-August period meant that we were able to focus on improving swim performance”, Tebeck said. Under the guidance of Fuse Multisport coach Steve O’Brien, Tebeck has recently completed a demanding 24-week structured swim program which included up to 7-sets a week, and a volume peaking at 40km/week, whilst still keeping up bike training, and managing University commitments. “Last season my swim performance meant that I had to play catch-up on the bike, especially in Auckland and Devonport. This year the plan is to be able exploit the bike leg a little more by coming out of the water nearer or with the leaders – which is really important in draft legal events”, Tebeck said. Tripodi’s preparation has been the polar opposite to Tebeck’s. Impeded by a reoccurring shoulder injury which has hampered his swim training until well into September, Tripodi has instead been investing in strength work on the bike and running track. It’s an investment which is paying dividends with Tripodi’s bike performance showing significant gains over late season races in 2012/2013. “I have been very happy with my early form on the bike”, Tripodi said. “We have changed things around a bit this year and have adopted a slightly different approach to training this year with only two focus sets each week, one bike set and one run set, and this approach has been working really well for me.” “Even though our goal races aren’t until late in the season, it’s good to get a few good results in now”. Fuse Multisport athletes Tebeck, Tripodi and Robert Buckley will next compete at the Sam White Memorial Aquathlon at Glenelg, South Australia, as a part of their preparation for the Mooloolaba Multisport Festival. 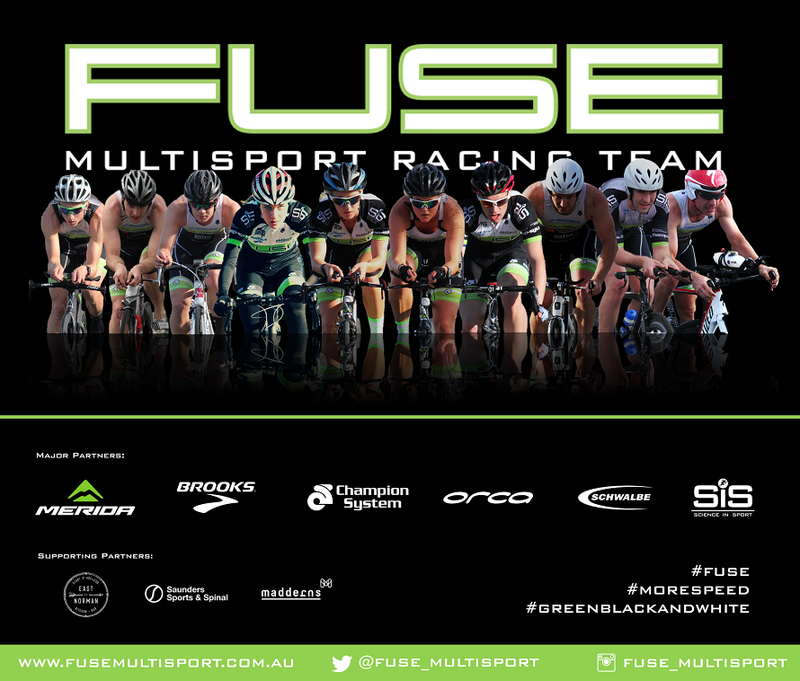 Fuse Multisport Racing Team is supported by its major partners Champion System, Brooks Running, Science in Sport (Australia) and Madderns Patent and Trade Mark Attorneys, and supporting partners The Marquis and Saunders Sport and Spinal.